Sa-wad-dee-pee-mai jow!!! Happy New year Thailand! 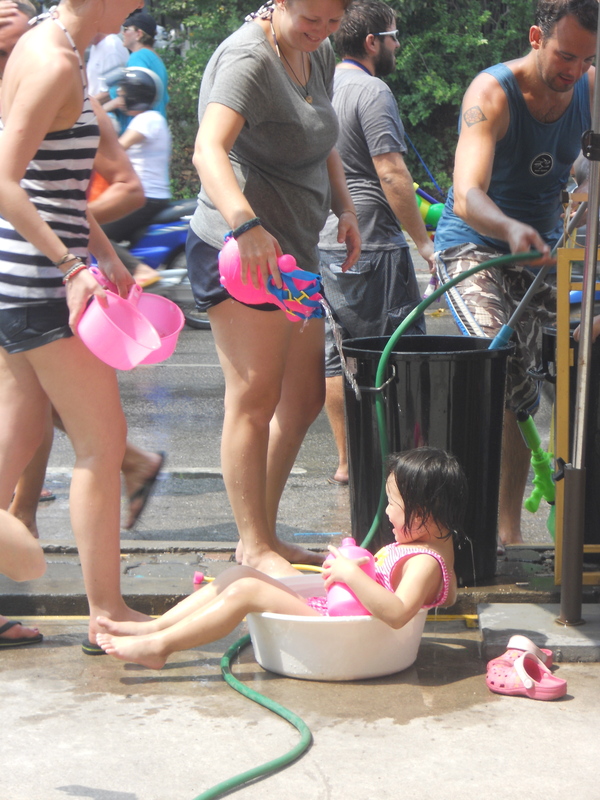 I’m now into the 3rd day of celebrating Thai new year (Songkran) which involves everybody regressing to children to join in the biggest water fight ever! 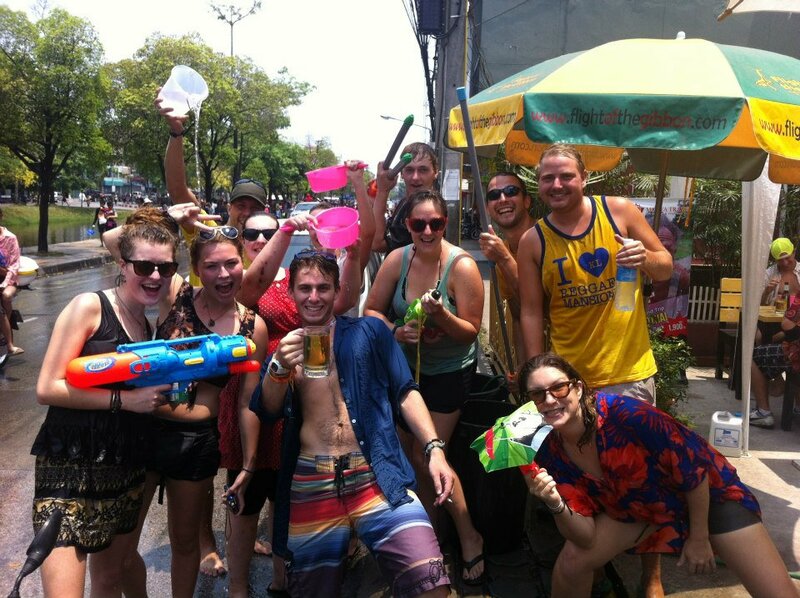 I believe waterfights are held all over Thailand but in Chiang Mai its mainly around the moat area. Tonns of people joined in, kids, old men, grannies, monks, thais and foreigners all come to together to soak each other over and over. All the bars are open, music blaring, and ice cold water is smashed into your face, whilst someone cheerfully calls out happy new year! Its a really happy celebration, and i think the best part is everyone joins in, no one is exempt. In fact the rule at the hostel was if someone’s dry they’re just asking to be soaked! In the morning everyone in the hostel worked together to terrorise the people on the main road outside. Our rules were not in the faces of people driving mopeds (dangerous) but passengers were definitely allowed a facefull. Old western men with young Thai brides, people wearing tie-dye and people with football shirts of opposite teams were all decided by the people in the hostel as good targets too! 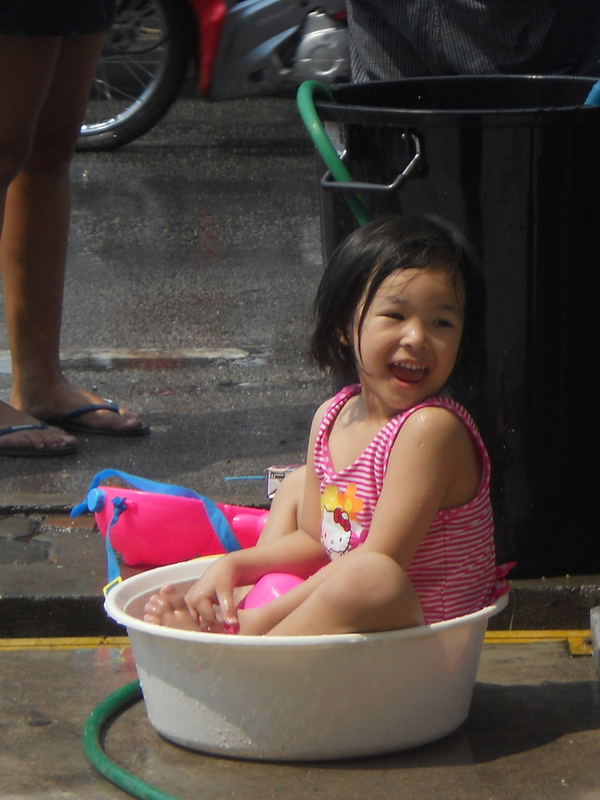 The best was when a songtaow full of people (public busses) went by whereby the driver would slow down so we could launch buckets of water through the windows, great fun! 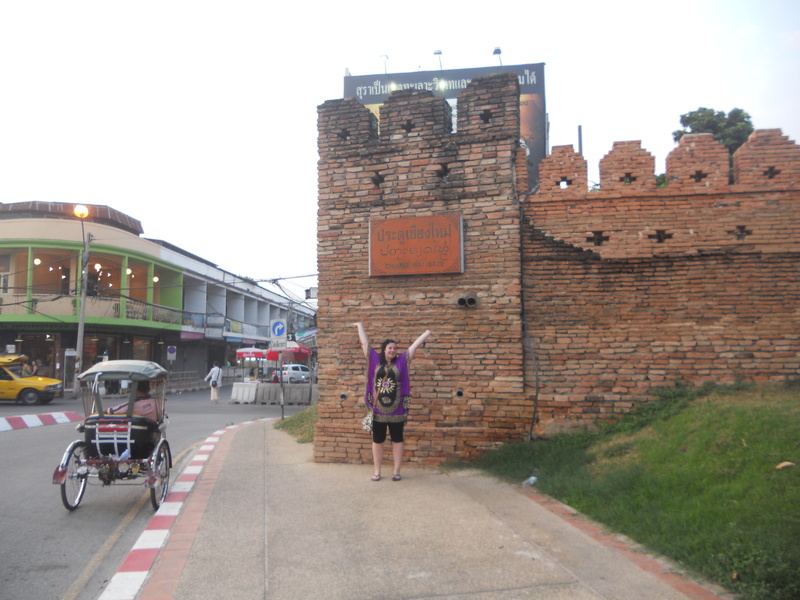 In the afternoon we made our way to Tha Pae gate, where everyone was on foot. There were huge stages with music pumping out and there had been a huge foam party, and people were going along on floats giving out free stuff; hats, water pistols and plastic cases so things didn’t get wet! The amount of people there was crazy, and water was constantly being dunked on us from all directions, some of it dirty river water, some with ice in that was freezing, some perfumed that people used little silver containers to pour on us so we were blessed. We stopped in a bar to refuel with water, and had a few drinks and jelly shots, then carried on to follow the crowd and ended up at the end of a procession through the old town, where all the more religious celebrations were happening. 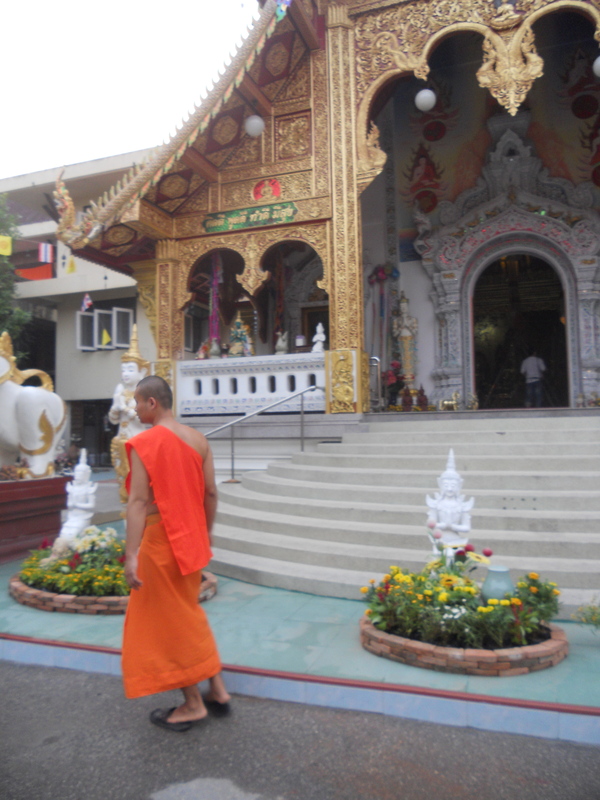 People danced in thai dress, and the monks sat outside the temples blessing people with holy water. In the evening all the water from the songkran festivities had turned into rain showers, as the humidity had soaked all the water up. Ironically people were soaked from water fights but still walking around with umbrellas. When the sun went down people stopped playing and the saturday night market opened up right near the hostel, so i was able to buy lots of gifts and souvenirs. 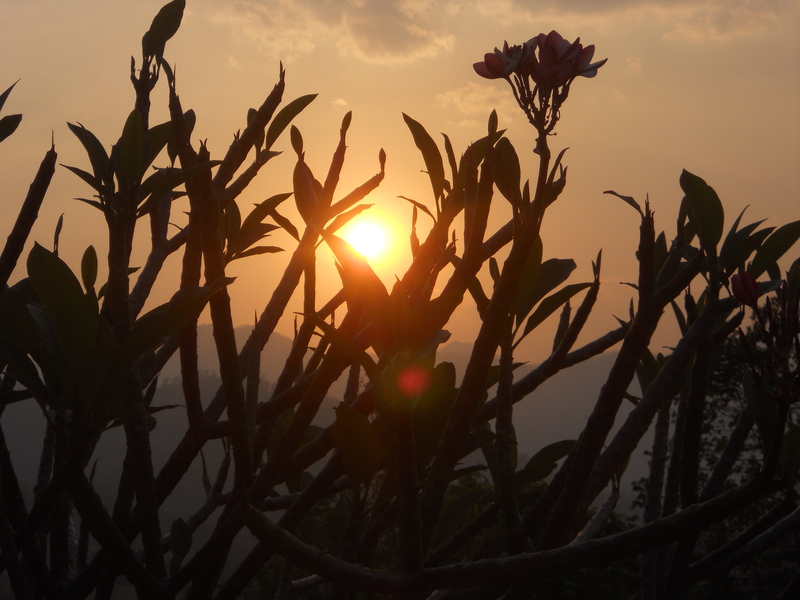 Pai is a hippy village at the top of the mountains. It takes 3 hours to get there by minivan from Chiang Mai and was a tough ride, because the drivers really put their foot down and there are lots of windy roads to get to the top. 763 in total, which left a few people on our bus feeling very sick. Inon, Susan and I decided to head for Pai, as everyone kept mentioning how laid back and nice it was, plus Jenn was there already and had emailed to invite us to stay at her resort, so we decided to go. 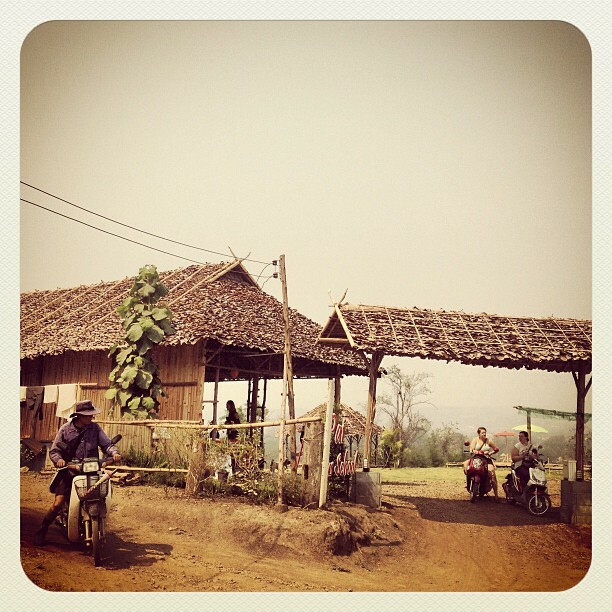 The bus ride cost 150THB (£3) one way, and we arrived in Pai on Saturday at about 3pm. 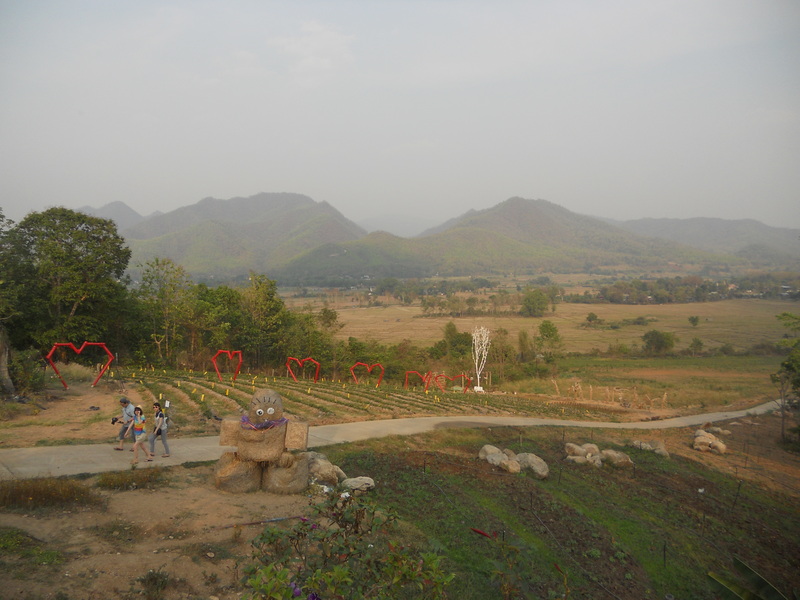 Since its all in the mountains, everything is a little spread out so we decided to hire a moped each (100THB per day). 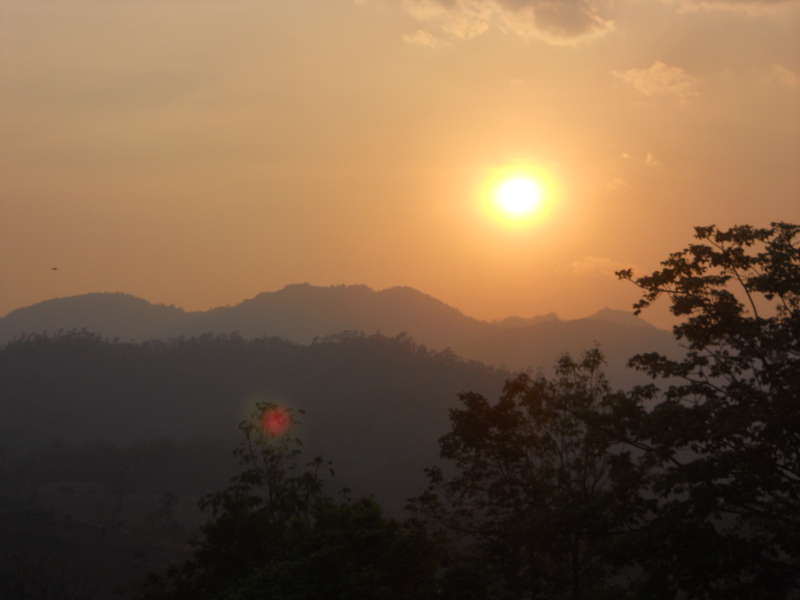 The resort we stayed at was called Tropical backpackers resort, and was out of the main Pai centre, but it was worth it as it was built on a hill and the view was pretty incredible. The resort is very laid back and hippy. 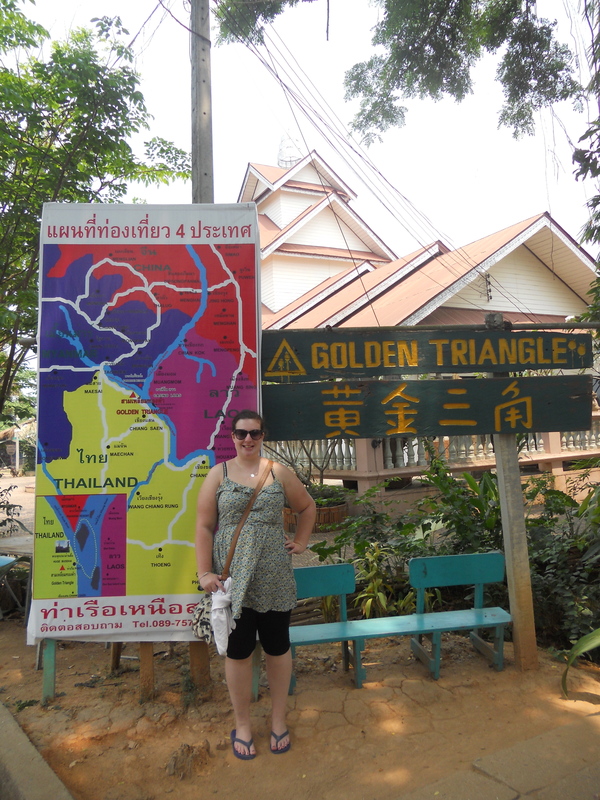 It has 16 “bungalows” that were triangular shaped huts made from dried leaves, that cost 180THB a night (£2.) Inside the hut is a double bed slightly raised form the floor by wooden poles and a window that opens at the end made from bamboo. They were very basic but pretty cute. There was a communal shower and toilet area, also made from bamboo and leaves. The bungalows were at the bottom of the hill and at the top was the communal area, with cushions and fairy lights. You could tell you were in hippy village, it was basic but clean, and everyone was friendly. We met Jenn and took the bikes out over the hills to look at the good views and then got some dinner in the centre, and did some shopping. After coming back to the resort we showered and got ready then walked the back roads to town and spent the evening in a bar called Edible Jazz. Everyone there was very laid back, there was an area with hammocks but most people were sat on cushions on the floor, and a guy played a guitar and sang for us all evening. At night time, the air was so much cooler, actually had to sleep with blankets wrapped round me it was so cold! The next day we continued exploring on the motorbikes. First we went to the Canyon, which was about a 50 minute drive away, and then a 10 minute climb to the top. 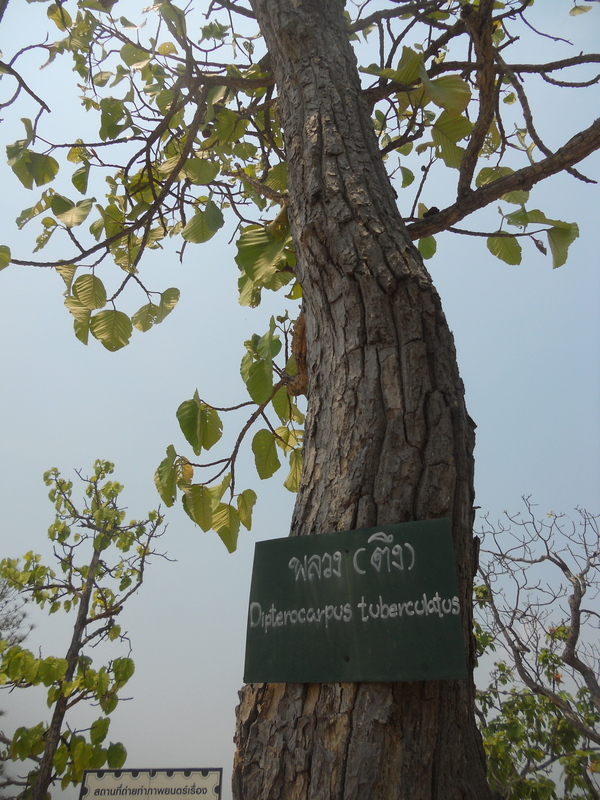 The views were good and there were lots of different species of trees with signs and their names on. Next we drove to a waterfall. There are 2 in Pai and I’m not sure which one is which, but this one was on the way back to Pai from the Canyon, up a very steep hill that says its only 5km away on the sign but isn’t. Theres a short walk from the car park and theres a small waterfall with a cold pool. Whilst there the 4 of us met a Spanish woman, Alicia, and 2 guys from Switzerland, who decided to join us as we went to find the cave. Following the map we realised it was really far away. We stopped to speak to some locals who told us it was over 80km away, so thought that was too far to accomplish on bikes, but she recommended the other waterfall which was nearby so we went there. This waterfall was much more impressive! It took a long time up a windy dusty road to get there, but once there we realised why the other one wasn’t so busy, everyone was at this one! 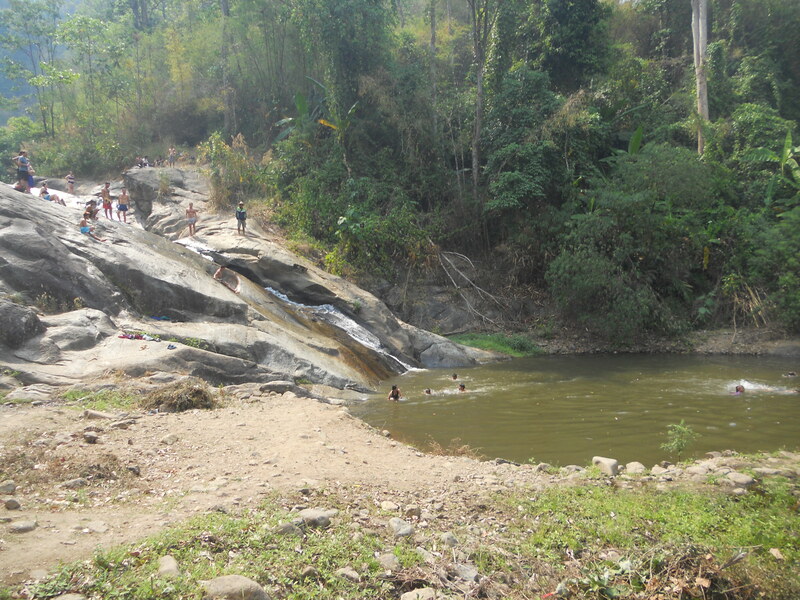 Theres lots of rocks that many people had climbed on, with a pool up in the rocks but also a pool at the bottom. Thai kids were using the rocks as a natural slide, throwing themselves down it into the pool at the bottom which I guess was deep enough. It was quite high up that where the thai little boys were starting, and I assume it wasn’t too comfortable on the rocks as one kid came out clutching him bottom with a rip in his pants. I stayed on the grass and watched the people around me, as everyone else jumped in and climbed the rocks. Once most people had given the slide a go, and i’d had a nap, we left to head back into town to get some food, and another girl from Canada joined us, so in total there were 8 bikes! On the way down i could feel myself getting close to the edge of the road so tried to turn into the right, to get back in the middle when my wheels hit dust and I fell. I was going about 40kmph, and I think I had time to break but I hit the floor face first with the right side of my body bearing the brunt of the fall. The bike fell on top of my foot, but I somehow managed to get up and get myself to the edge of the road, by which time everyone else had stopped and was surrounding me, and I totally freaked out. There was blood everywhere, my clothes were ripped and ruined and as my nose had hit the ground it was bleeding, but in my shocked state I thought my nose had fallen off, but it was fine, though everywhere else was bleeding too. Two french guys who saw the accident came to help me, and tried to wash my wounds with water and alcohol, but my foot had a really deep cut, and lots of dirt in so someone made the decision I should go to hospital (I was freaking out too much to make much sense at this point.) It was decided i would leave my bike there and get on the back of Inons’ bike, who dropped me off at the local hospital, while he and Jenn went to the bike place to tell them what happened and to get the bike back. At the hospital, Susan let me squish her hand as the doctor cleaned and bandaged my wounds, whilst I screamed the place down, and he gave me antibiotics for the pain afterwards! Alicia then took me on the back of her bike to the resort, via a pharmacy to get more gauze to change the wounds and dinner at a restaurant. That night I took all the medicine and slept soundly, though I probably wouldn’t have managed without Susan there to help me hobble to the bathroom and up and down the hill, as well as changing the dressings for me. I’m so grateful to her so if you’re reading this Thank You! 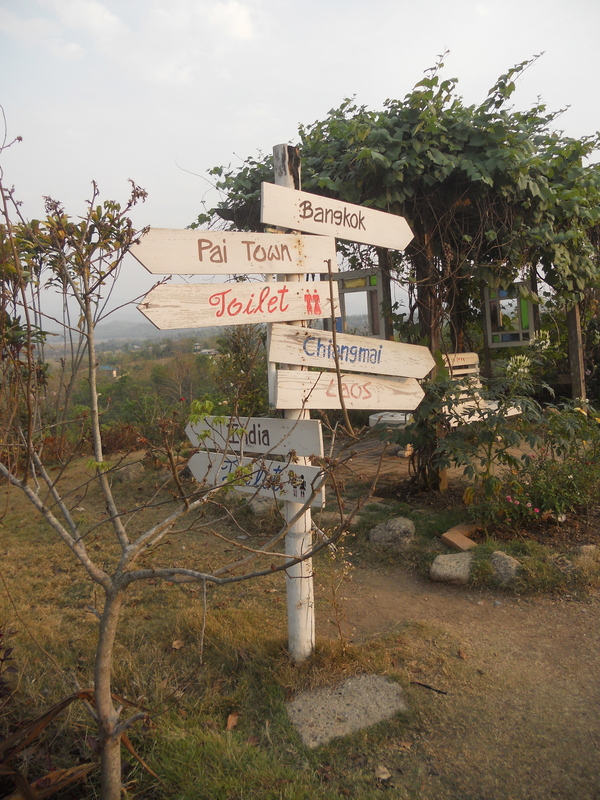 I am also extremely grateful to Tony and Oi, the owners of Chiang Mai backpack house. When I arrived all bandaged up they got straight to work worrying over me, and Tony got the first aid kit out and cleaned again my wounds and covered in bandages. He was worried they were infected so in the morning he took me to the hospital where they got me a wheel chair and took me round to a room where they thoroughly cleaned my wounds (Tony let me squish his hand as I was in so much pain) and put Iodine on everything to try and dry them up. The also cut some of the skin on my foot away to get some stubborn gravel out. I spent all day resting in the lobby with the other guests and today I went back to the hospital, and this time Oi, Tonys wife took me, to change my bandages and clean wounds again. Yesterday it cost 200THB (£4) and today 100THB (£2) so not worth bothering the insurance over! The nurses were friendly and said this evening I can leave my knee unbandaged so that it can dry out, but they are still worried about my foot (and I still cant walk) so to keep going back every day as the wound is really deep. Everyone is getting ready for Songkran (Thai new year = water fight) and I really want to be able to join in, so hoping ill be recovered soon as it starts in 2 days! The next few days I decided I needed to rest! I spent thursday morning going to Chiang Mai Ram hospital to get a chest x-ray for my Australian Working Holiday visa. I was pretty impressed with how everything ran smoothly and at each part I hardly had to wait to see someone. I had to fill in a few forms, get passport copied, and have height and weight checked and blood pressure done, then some more forms and then I was taken to be x-rayed. I got changed and was x-rayed, and everything took less than an hour and half, which went quite quickly! I was also given a laminated hospital pass with my name, photo and details on should I ever need to go again. At the end I was charged 1,500THBt, so £30, which I thought was reasonable. In the afternoon I paid 300THB (£6) to use the swimming pool in a posh hotel about a 15 minute walk away. It was a lot of money, but was nice to be pampered. Jenn met me there later and we read our books, chatted and had a cocktail whilst sitting in the pool, before she had to get her bus to Pai. The next day was also spent relaxing, this time with Susan (from USA also) who joined me in my female dorm at the hostel. The hostels owner, Oi, took us to a local outdoor swimming pool near her daughters school, called Chiang Mai Land, where the pool was HUGE! 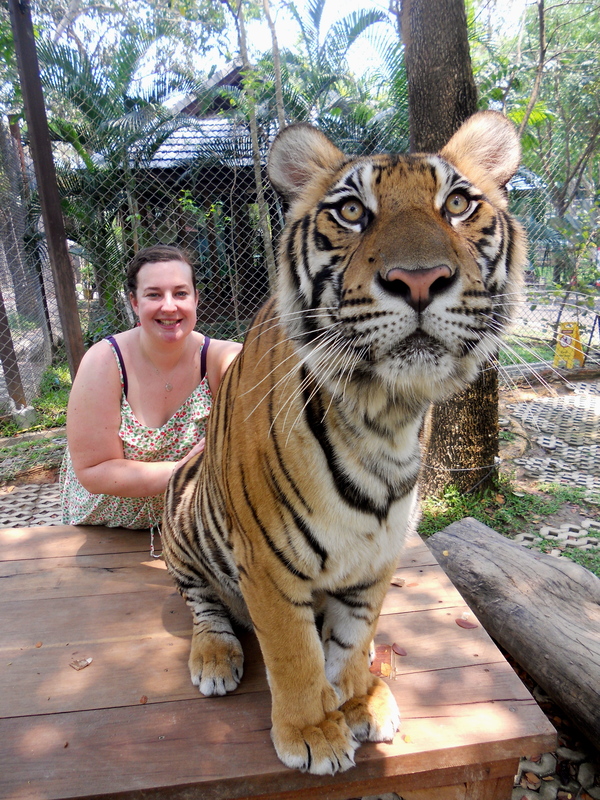 It was only 60THB (£1) for the day to use, and we paid an extra 30THB to rent out a sun lounger for the day. If anyone wants a bit of peace and quiet away from the city then I recommend this place, it was cheap but really nice. In the morning it was empty and only got fuller with the childrens’ swimming lessons. It was also nice that there was a mixture of thai people and foreigners there. They also served food (western and thai) that was cheap but tasty. To get back we were able to flag down a red songteow and pay 30THB back to the hostel. 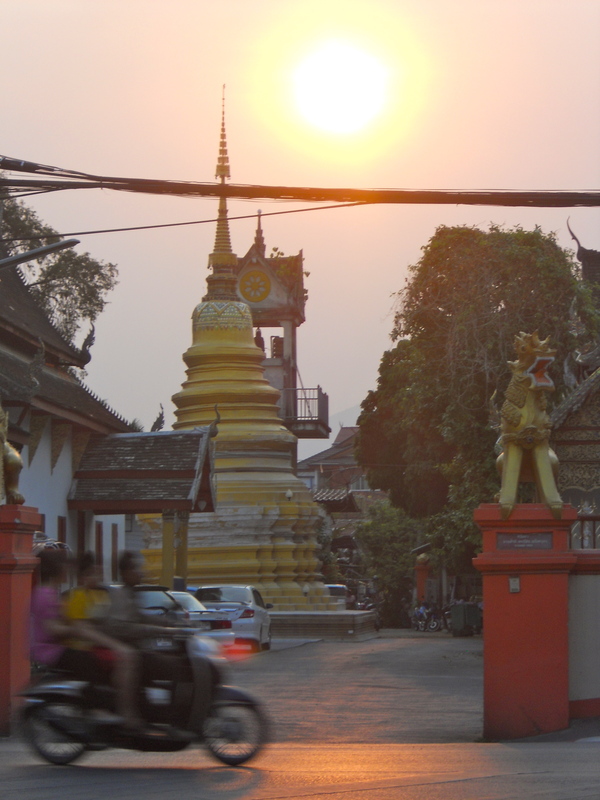 In the evening we met up with Inon, who had finished his trekking, and went for thai food in the old quarter. The following day we all woke up about the same time, and had breakfast at the hostel. Inon was picked up and taken off for his 3 day trekking in the jungle, whilst Jenn, Pierce and I decided to go to Tiger Kingdom. Our hostel offered to take us in the Jeep (aircon yay) for 100THB each (£2) and as it’s over an hour drive away we thought that was pretty good. The driver also waited for us to finish and drove us back, and also took us to lunch and once again waited! This hostel (Chiang Mai backpack house) is really so kind, I can’t recommend it enough. At the end of the trip the driver even said don’t worry about paying, and I said no he had been fantastic! 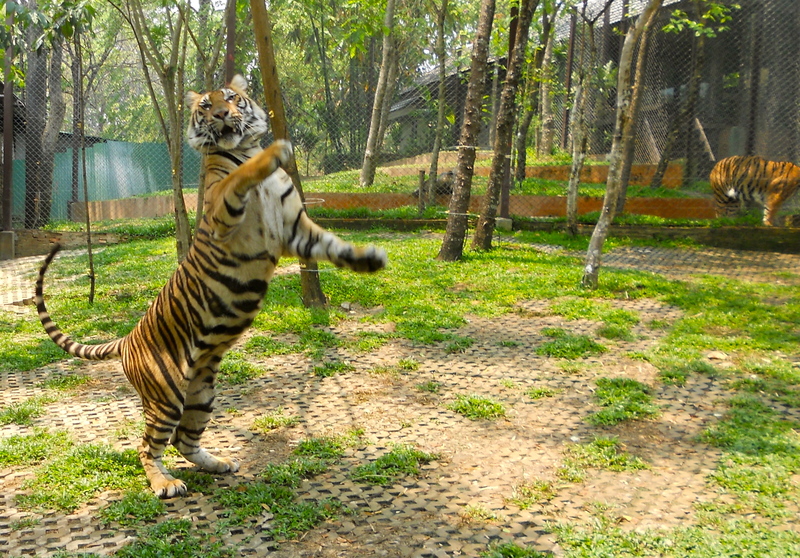 Tiger Kingdom is free to just look around but you have to pay to go inside the enclosures. To go see the babies its 600THB or the adults 400THB. 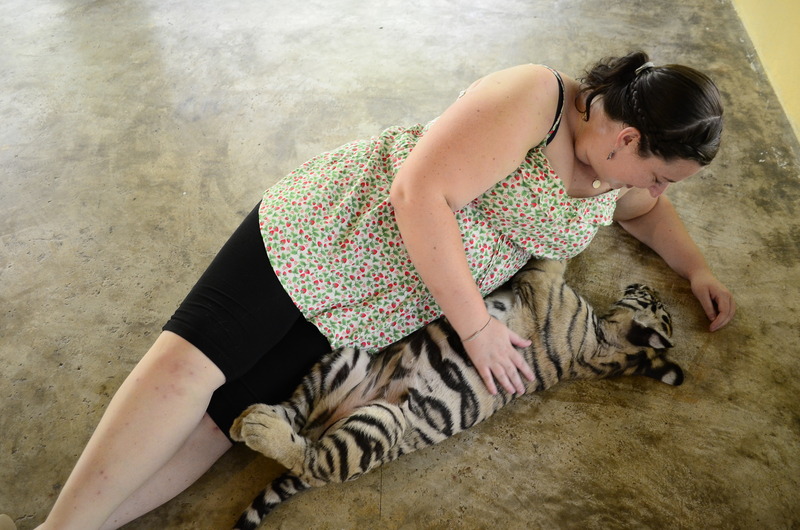 I paid 1900THB (£40) to go to see babies, small1, small2, medium, and adults, and have a free CD made with a professional photographer in one enclosure (babies.). 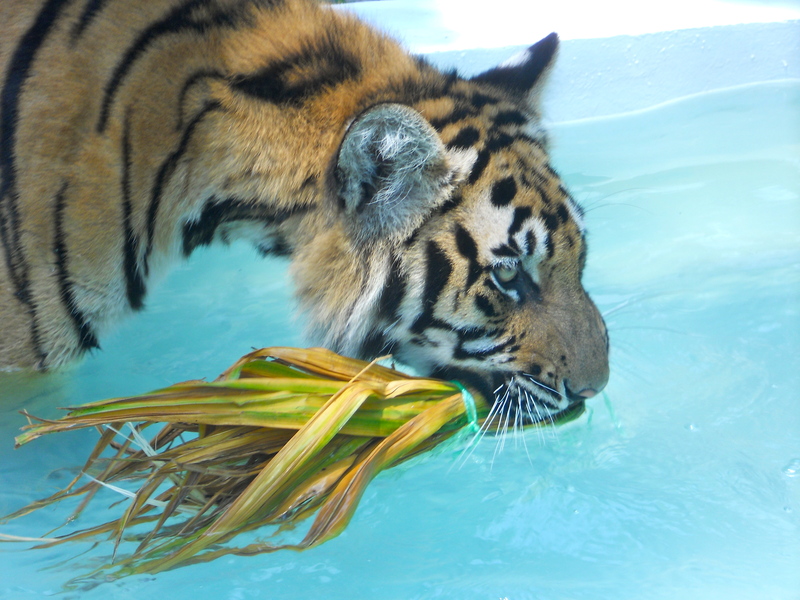 I figured I wouldn’t get the opportunity again and I wanted to make most of it, but to be honest the babies are small, and the rest of the tigers are big and the adults are huge, so you probably don’t need to go to all enclosures! 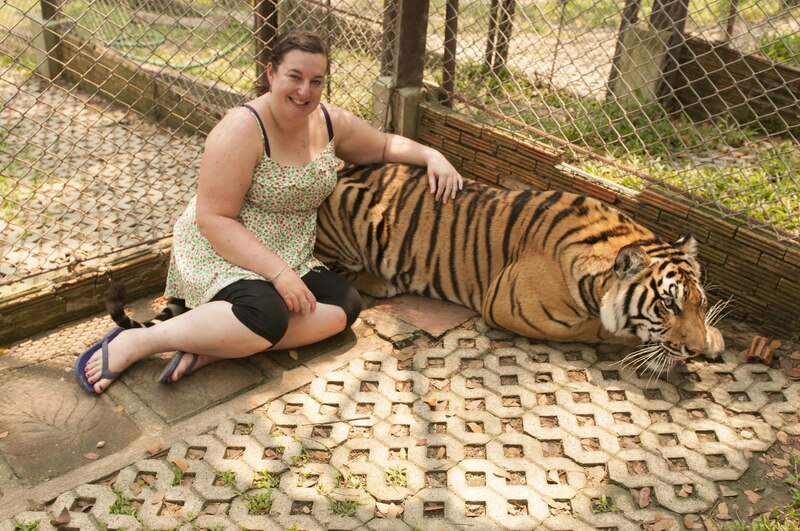 There are other deals too, depending on how many different aged tigers you want to see. Me and Jenn paid to see all, and Pierce just paid for the adults, so we all went round together taking photos. The babies were obviously adorable, and quite playful. 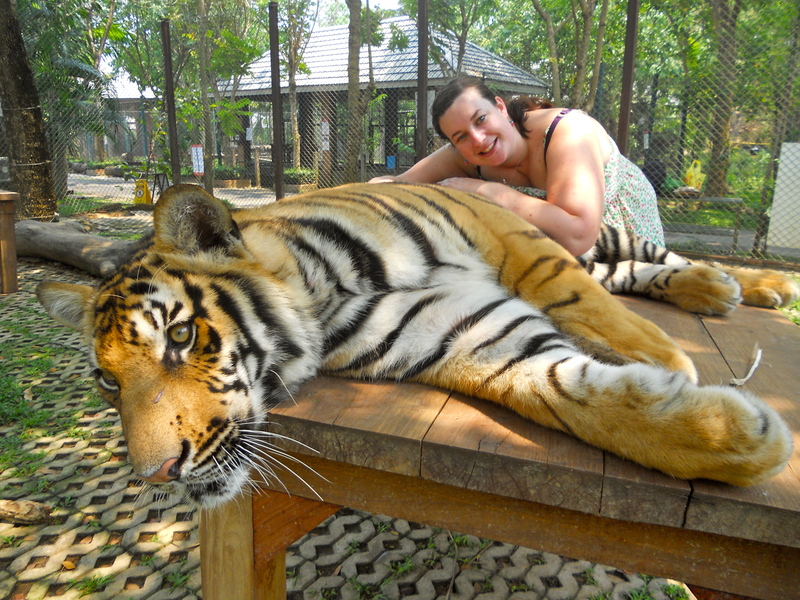 One of them that I was posing with had a dream and rolled over into my arms! 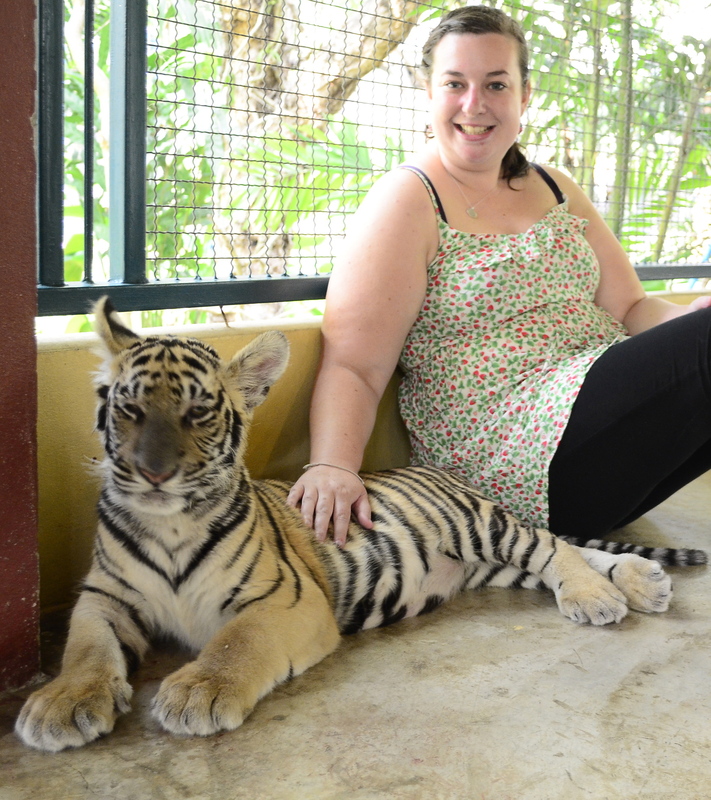 However some were alert and awake and to prove it when we were in the small2 enclosure, as it was just Jenn and I and no other tourists the carers played with the tigers and got a toy that they could run around and catch. 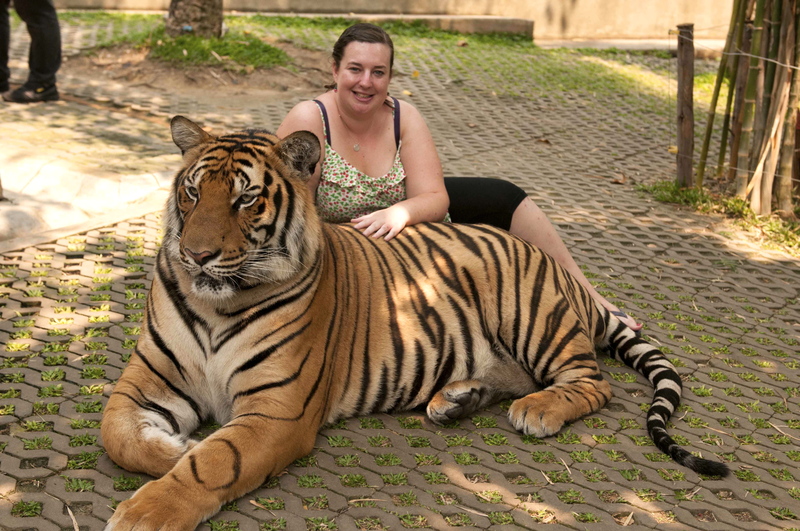 Having 5 near fully grown tigers fighting 5 foot in font of you over a toy is definitely a unique experience. I got some great shots of the tigers jumping. After the tigers I came back to the hotel and ended up speaking to the owners for 4 hours! Just about why they chose to open a hostel and how cute their daughter is (Think Boo from Monsters Inc!) Later that day I met Jenn at her hostel and went to check out the Night Bazaar, but we didn’t get very far as ended up in an american style restaurant eating dinner. The day started with being picked up and driven for an hour into the countryside! 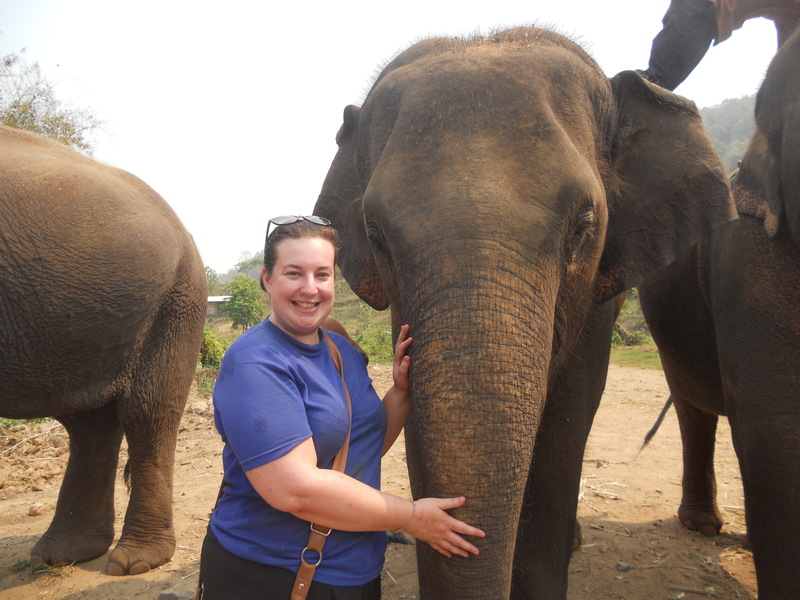 I was really excited for this day as I had booked it online, a 2 day elephant training course at Woodys Elephants. [Please note I did research and these elephants are really well looked after, Woody thinks of them as his family, he gives them lots of breaks and he always puts the elephants first. There are no tricks or shows here.] When I arrived I was told it was just going to have to be a day training for me as they thought I would be with a friend and didn’t want me to stay overnight on my own, which was a real shame, and I was gutted, but I still had the day to enjoy at least! Woody came in and introduced himself and told us how much the elephants mean to him and why he does this! We were then taught some basic commands in thai, and as everyone started writing them on their arms I’m glad I know some thai language already! We went down to the areas where the elephants were kept and fed them bananas, where after each time they would give us kisses!! Also met the babies, called Happy and Sky, My elephant was called Fah, which is Thai for Sky, and she was Woodys favourite. I can tell why as she was really well behaved! To start training we had to learn how to first climb on the elephant, which is harder than it looks. You have to grab the top of the elephants ear with right hand then shout Yuk Ka! so the elephant lifts its leg up, then put your left foot onto one side, and your right foot on the elephants knee, then shout soong, and the elephant lifts you higher so you can then somehow throw your left leg round and end up on the elephants neck. None of mine were that elegant, but i got up! (See pics below) Once up we were then taught how to use the hook (its blunt, and not used to harm the animal) but to gently press on the temples on the opposite side of the way the elephant has to go, whilst kicking the elephants ear, and shouting in Thai. So, if you want to go left, you use your left hand to put the hook onto the elephants right temple and shout “Sai” whilst kicking your right foot. All the time using your other leg to hold on round the elephant neck because there is no other way to hold on and when the elephant moves its really difficult! Also practised the other way and Yut- stop! Then I got back down. Getting down is the reverse of getting up, but every time I missed her foot and sort of just slid/fell off of her. I said sorry in Thai each time. 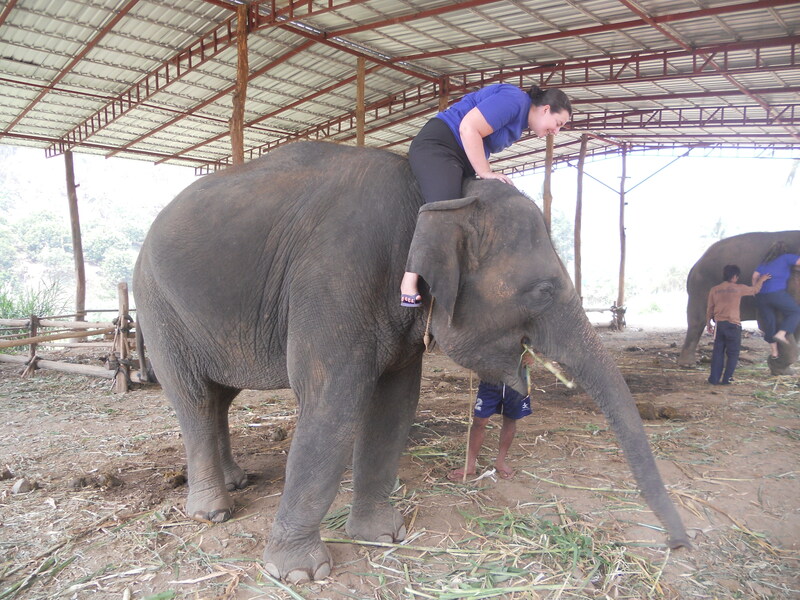 After learning how to turn, we then tried getting on the elephants and going forwards and backwards, then gave the ele’s a break and cleaned the shed for a bit. Lunch was included so after cleaning ourselves we had potatoe soup, rice, sweet and sour chicken and lots of pineapple. The afternoon was the best part. 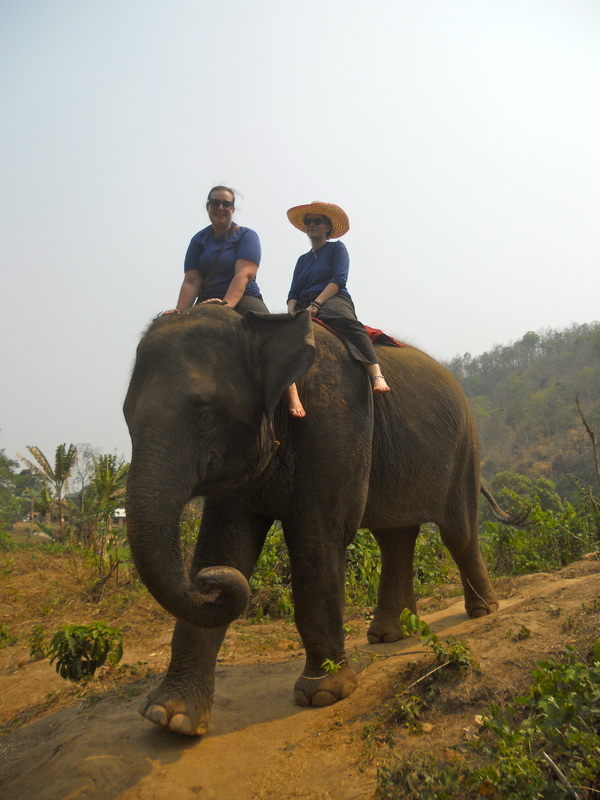 We once again climbed on the elephants, sat on its neck and went on a trek round the whole area! Its really hard as there is nothing to hold on to and you bounce around, and going up and down hills means you’re falling about lots too, but it was really fun. Halfway the elephants got a break and we were taught how to make a straw from a banana leaf so that we could all have a drink of water. At the end of the trek, the elephants were given “candy” – sugar cane, as a treat. 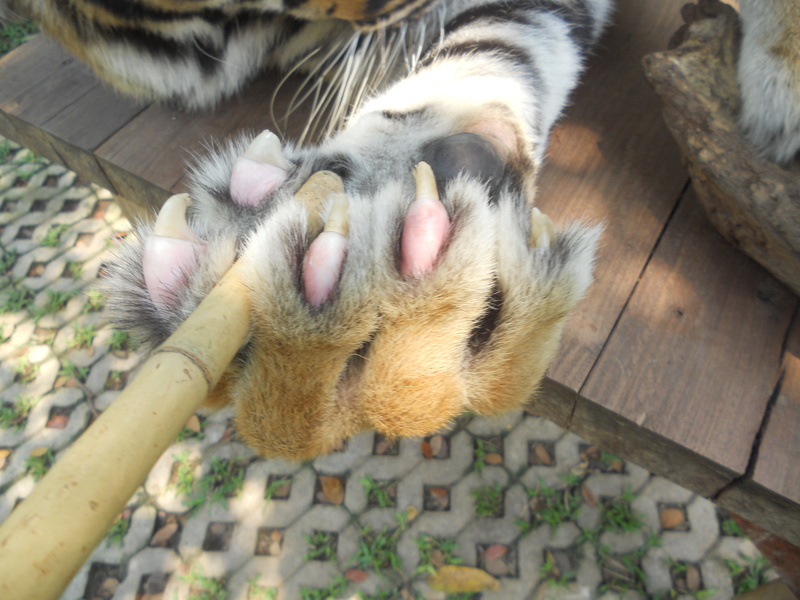 One of the mahouts told me we could eat it too, and used his teeth to peel it for me. It was pure sugar! 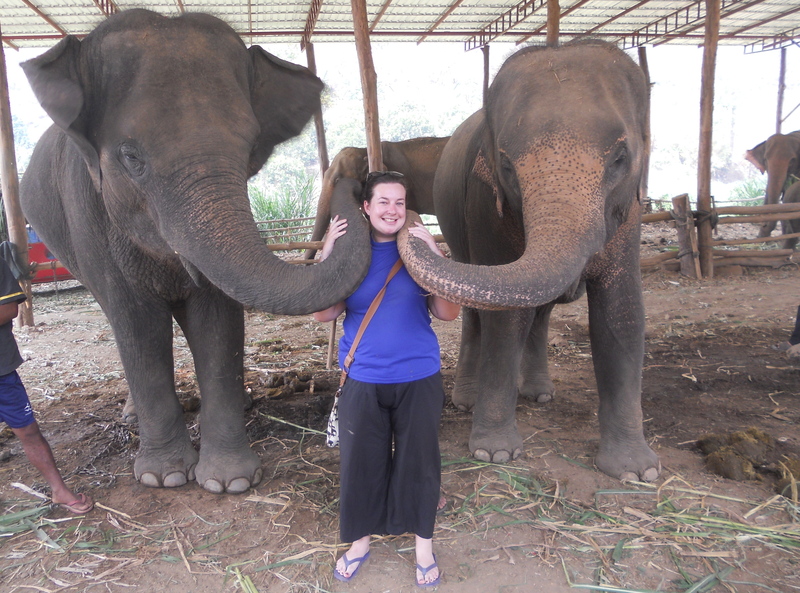 I wanted a photo of me eating the sugar cane and the elephant too, but as I went to pose the elephant used its trunk to grab the cane out of my hand. Guess it didn’t like me stealing its sweets from her! After another rest the elephants went into the river and were told to lie down. 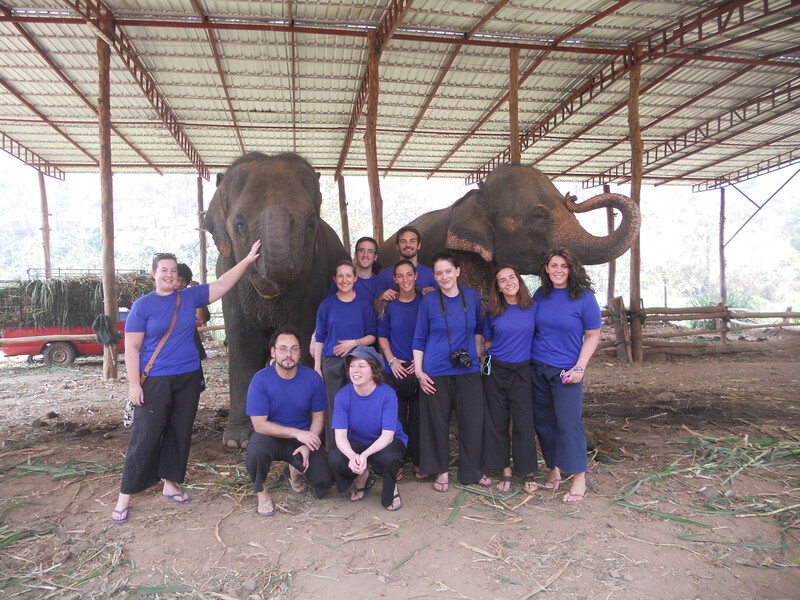 We were given brushes and told to get in too, to give them a clean, but really it was a huge water fight, the elephants winning as they squirted at us with their trunks. 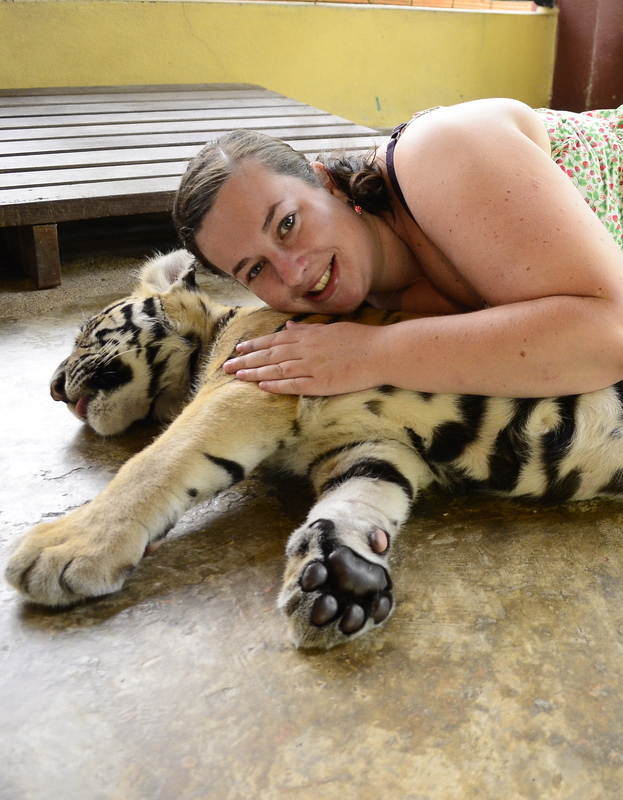 The baby also joined in and was such a cutie, mainly falling around and loving all the attention! We got out the water and climbed onto the elephants again and this time we went into the deep lake, so that the elephants could go swimming with us on their backs, was hilarious and a few people nearly fell off! 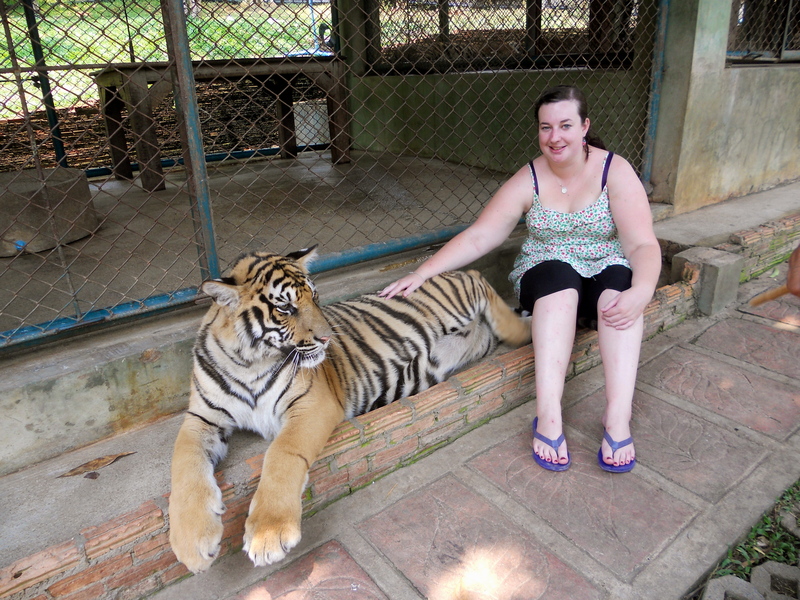 At the end I paid just for the one day training, not 2, and it cost me 2000THB, so roughly £40 and worth every penny! I was super happy with the day and when I got back to the hostel it was made better by being invited by 2 guys (Pierce from UK and Inon from Israel) to go get drinks. We ended up in a rooftop bar overlooking Chiang Mai and inviting another girl who was sat alone (Jenn from USA) to join us, and had a really good night meeting new people. 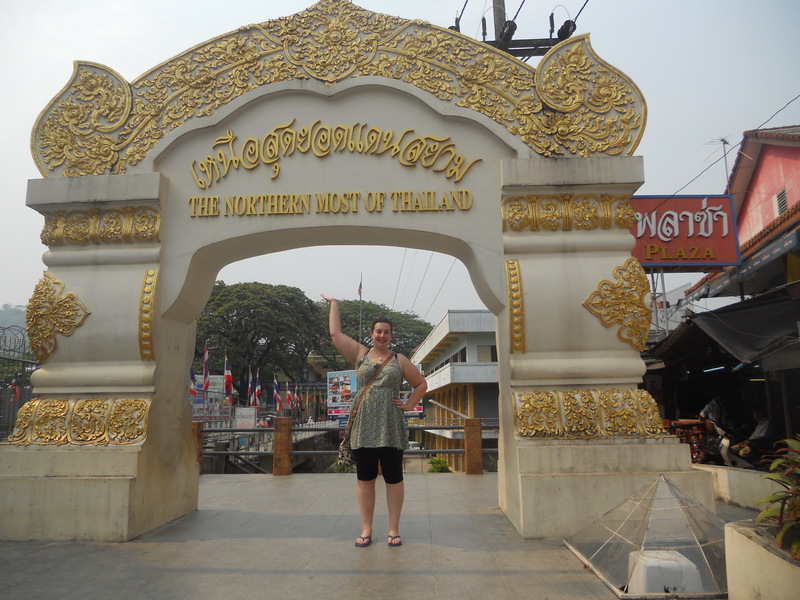 Chiang Rai and the North! I got picked up at 7.30am by the tour company in a mini van then after driving for an hour we arrived at the hot springs. Since I live by the hot spring in khaochaison this wasnt that exciting for me, but least it broke down the journey. 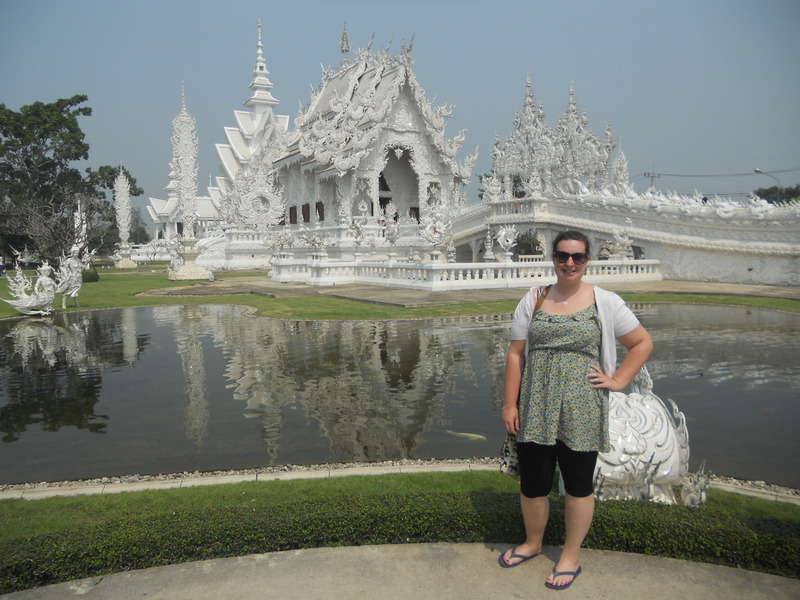 We drove for another hour and half until we were in Chiang Rai, and visited the White Temple, whose correct name is Wat Rong Khun. I got talking to 2 girls from Hong Kong who were in the same minivan and we went round together taking photos. 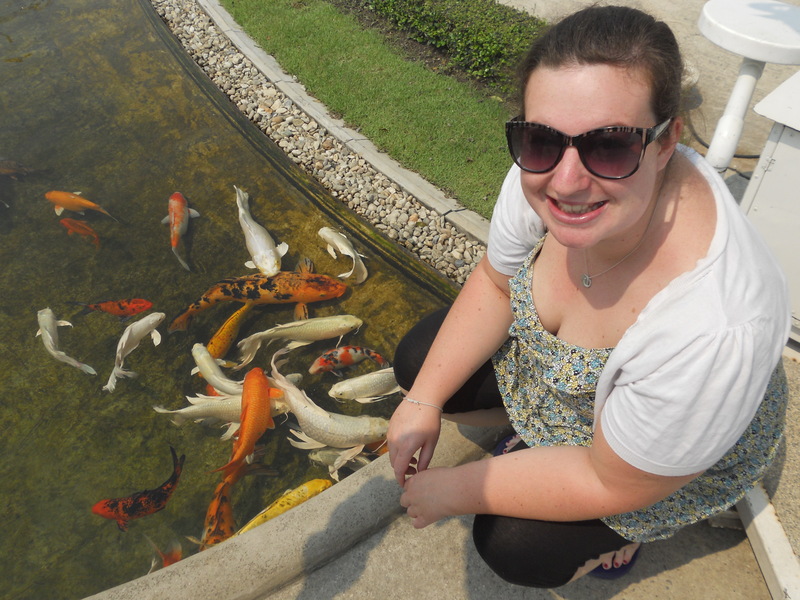 It was really beautiful, and even the koi carp in the river were white and matching too. To get to the actual temple, which represents paradise you have to walk through ‘hell’ first, which shows lots of hands and skulls as you cross the bridge to it. Its a one way system to enter the temple as its so busy with visitors, and inside they are still painting it. On one side the decorations were typical of a temple but on the other side there were paintings of the twin towers, of superman, doremon, and lots of cartoon characters, which was odd. Another interest in the temple was a building all painted gold, which was in fact toilets. The nicest toilets around! We then got back in the bus and drove another 2 hours to the Golden Triangle, which is where the river separates Thailand, Myanmar and Laos. 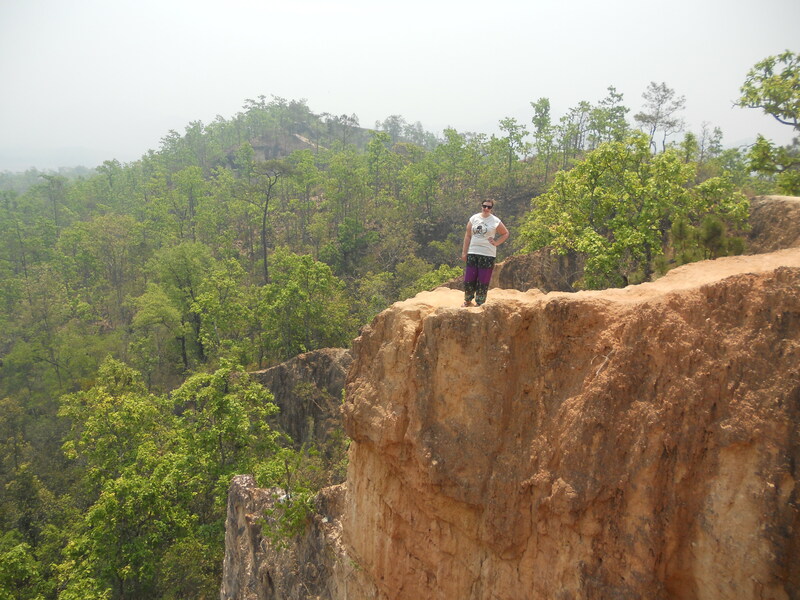 We climbed into long thin woden boats and the cruise took us along the river and stops in Myanmar and Laos. In Laos there was a market selling local gifts. 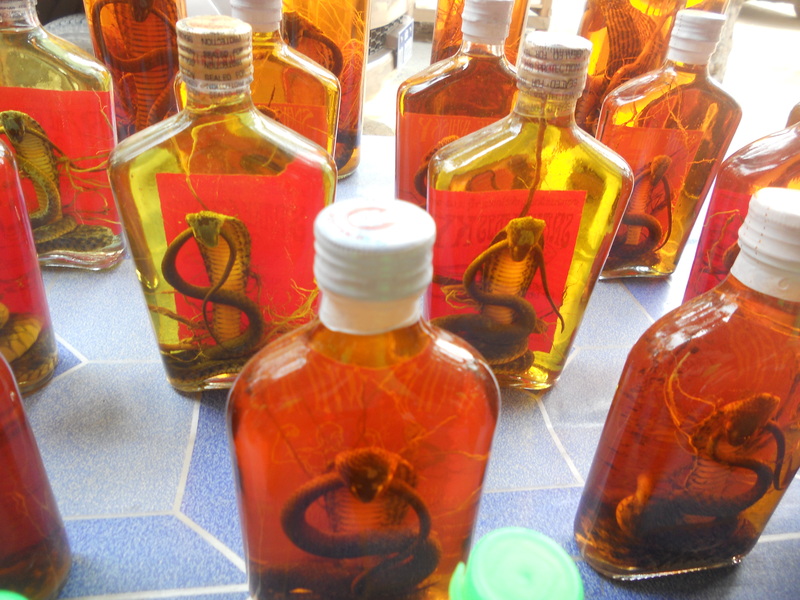 One of the wierdest gifts was a bottle of whisky with a snake inside. 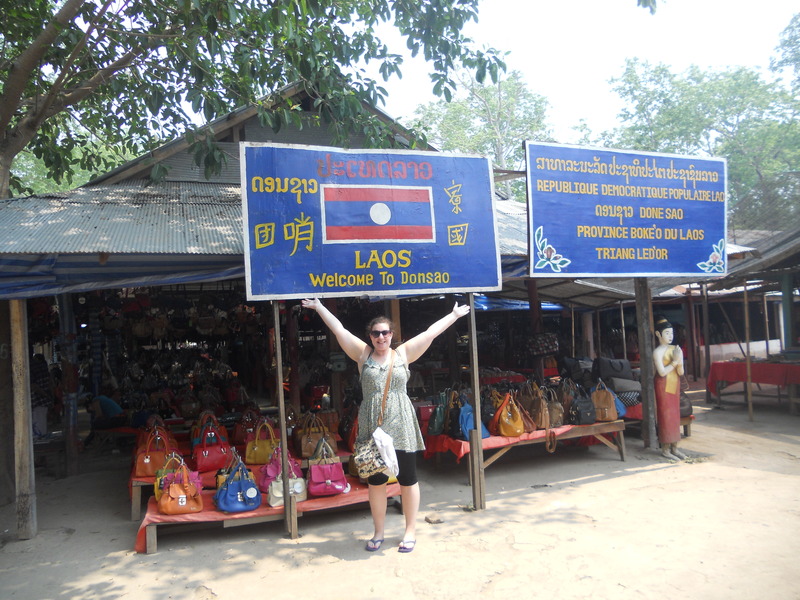 A chinese man helped me take photos with the Laos signs, and I took some of him too. On the boat back to Thailand I got speaking to an Australian couple from Adelaide who were on the same tour but different bus, and I bumped into them at all the next stops too. Half hour later we arrived at a buffet lunch, then continued another half hour to the Northern most point of Thailand, where there’s a bridge to cross to be let into Myanmar and a market area. We stopped for half an hour so some people could do visa runs and others could go shopping. 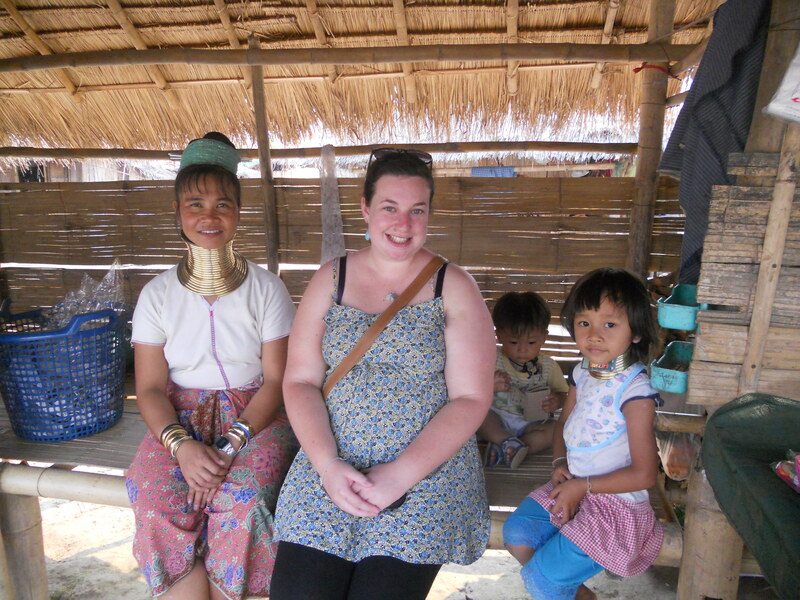 Another hour drive and we met the Karen tribe. These are people originally from Myanmar that fled to live in Thailand where they are more welcome. 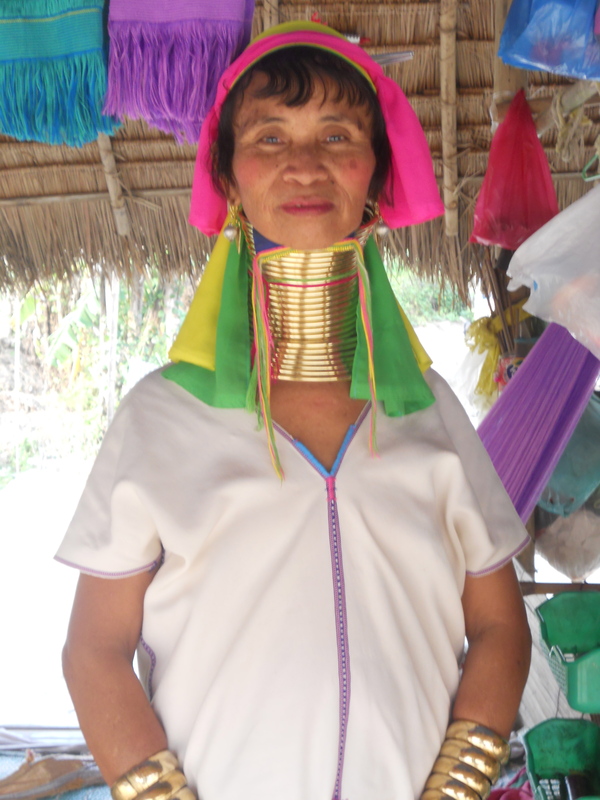 They have long necks because they have metal coils stretching and holding their necks up. Its only the women that do it, so even the little girls have started! They live a simple life in the mountains making gifts and scarfs to sell to tourists as income. The ride back to Chiang Mai was 3 and half hours, and on the way I got talking to a South African couple who live in Dubai and ended up discussing world cultures and the whole bus joined in, which made the journey go a lot quicker!